Review by AllTheBestFights.com: 2016-01-09, good fight with some tough exchanges: Vincent Feigenbutz vs Giovanni De Carolis 2 gets three stars. The 20-year-old Vincent Feigenbutz (11 years younger than De Carolis) entered this fight with a boxing record of 21-1-0 (19 KOs=90%) and he is ranked as the No.25 super middleweight in the world while his opponent, Giovanni De Carolis, has an official record of 23-6-0 (11 knockouts) and he entered as the No.35 in the same weight class. Feigenbutz suffered his only loss in 2012 at his second professional bout, against Roman Alesin, since then he has collected 20 consecutive victories beating De Carolis in their first bout (but it was a controversial decision Feigenbutz vs De Carolis I). 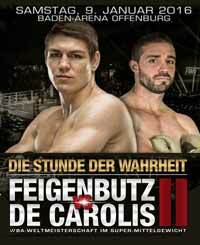 Feigenbutz vs De Carolis 2 is valid for the WBA and GBU World super middleweight titles. Watch the video and rate this fight!